Given that approximately half of humanity menstruates at some point in their lives, Aida Salazar says it's a real testament to the patriarchy that women feel shame or embarrassment about their periods. Salazar wanted better for her daughter's generation, so she wrote The Moon Within, a coming of age novel written in verse. 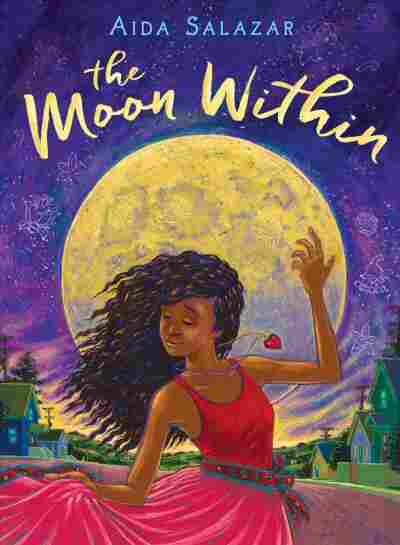 The story centers around Celi Rivera, an 11-year-old girl growing up in Oakland, who is mortified that her mother wants to celebrate her first period with a moon ceremony. Moon ceremonies date back to pre-colonial times, Salazar explains. Women across the Americas would gather to celebrate their bodies and their connection to the universe. Salazar didn't have a moon ceremony for her first period, but she did celebrate her daughter with one. "I wanted to reframe the conversation," Salazar says. "I wanted to tell a different story to her." Salazar says she wrote The Moon Within for her daughter, and her daughter's generation ... but she wrote it for someone else, too: "In some ways, I wrote it for myself, because I needed that kind of healing," she says. My daughter is a dancer and so she we invited her dance teachers, and we invited my sisters, and our family, and our chosen family as well. And we gathered beneath the full moon and we did many of the rituals that are described in the book. ... There's something very powerful about bringing intention to the understanding that we are connected to a cycle that is bigger than us. I wanted this book to be part of the movement to dismantle that — to take apart those notions, to reframe the idea that our menstruations are something dirty, or to be feared, or the "curse." I wanted to shed light on its power, and its beauty, and its really profound celebratory aspect. I think that's the way that we're going to be able to change ... those Puritanical and patriarchal views of menstruation. ... I also wanted to reframe the way that we, as women, view our bodies, and how we teach our children to view their bodies: In a way that's positive, in a way that's celebratory — with reverence and respect and love. It really, really moved me profoundly. ... Colonization basically eradicated all of our written documentation in the Americas, and we have very few fragments of knowledge. ... All of our traditions have been passed down through word of mouth and also interpreted — which is a really powerful way to retain story on its own — but to have written documentation that women have been honoring the moon and celebrating their bodies, and their transitions, their milestones, in this way was such a blessing. I really felt like my ancestors were watching over and blessing this book. I took my inspiration mostly from the pantheon. If we look at the [Meso-American] gods and goddesses, many of them were dual in nature. ... Ōmeteōtl was the creator spirit and they were neither male or female but both — divine duality. And so I felt like this was an opportunity for us to remember — to rescue — some of this knowledge and be inspired to use it in a way that was compassionate and loving towards our gender expansive friends. Las Musas is my heart and soul. ... We're seeing more and more Latinx people being published and ... we wanted to come together as women and non binary people to make a claim that we are not only here, but that we are not in competition with one another. That there is enough space — and, in fact, we are so diverse that we need more space than what we're given — to tell our stories. And that children in particular are ready and need what we have to bring to publishing and the book world. I hope that it reaches boys, and girls, and gender-fluid children. I hope that it reaches the child that seeks to see themselves reflected in a book. I hope that it reaches the child who is ashamed of their menstruation or ashamed of who they are, [or] where their gender lies. I hope that it reaches children who need to feel empowered by the beauty of their bodies and the beauty of their own transformations. Audrey Nguyen, Sophia Boyd and Samantha Balaban produced and edited this interview for broadcast. Beth Novey adapted it for the Web.